Of all a vehicle's suspension components, nothing works harder than the shock absorbers, making it critical to pick the right one. 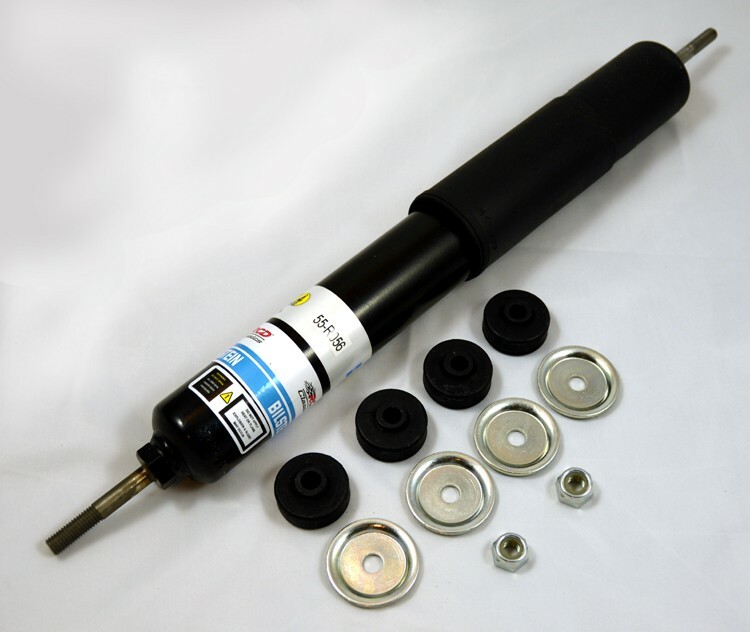 Bilstein Shock Absorbers are the least expensive, fastest way, to dramatically improve the ride, handling and control of a vehicle. The piston head design allows independent tuning of the compression and rebound damping forces to provide optimum ride comfort and performance without compromise. It features fewer parts than most conventional twin tube and so call "adjustable" shock designs. This simple, yet exceptional functional digressive design contributes to the extreme durability and long life of Bilstein Shock Absorbers. Specific custom tuned valving is ideal for the lightweight rear of a vintage Mustang. The Ultimate in Comfort & Control. Mono Tube Design, means a much larger working piston diameter. Seamless Tube by a special extrusion method. Split compression and rebound valving, to soften the ride and control the bounce. Mono Tube Design allows the excessive heat from the oil to dissipate more quickly. Separated dividing piston holds pressure on the oil to prevent aeration (foaming) that leads to performance loss. The last shock, you will ever have to buy. I have these on my 68 Mustang. They replaced a 3 year old set of KYB-GR2's. The Bilsteins have a larger shaft, a much larger body. The Bilsteins are a much better shock. The Sport valving is a perfect match for my 600 lbs front springs. The ride on the street is not harsh or rough at all. Very smooth ride. I haven't had a chance to take them on the track, but based off how they behave on the street it should be a good match. Just letting you know that we fitted the Bilstein shock absorbers that I got from you plus new springs to my 1965 coupe last week & the difference in handling is nothing short of bloody amazing. It is a whole different car to drive & handles like there is no tomorrow. Thank you for your advice & service & hopefully, when I finally get my other car (1966 convertible) back on the road, I will get another set from you for it also.